Has my heart been knit together in love? Have I reached all the riches of full assurance of understanding? How about the riches of full assurance of the knowledge of God's mystery? 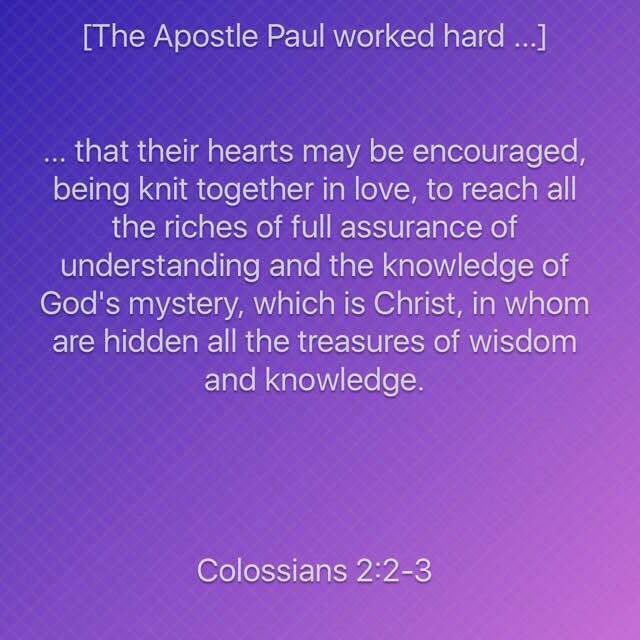 Paul and I are referring to my spiritual, Christian marriage to Christ, in whom are hidden all the treasures of wisdom and knowledge. He is the bridegroom and the church, His body, of which I am a part, is the bride. Together, the two have become one. In today's verses from Colossians 2, we have the word "mystery" again. In Part 1 of Married to Christ, I quoted from Ephesians 5 which is often used as marriage seminar material. However, I attempted to show that earthly marriage was merely used as an analogy for the "profound mystery" Paul was really talking about. This profound mystery is what Paul was emphasizing, not earthly marriage. I used to believe that the cliche "God moves in mysterious ways" applied whenever the word "mystery" was used in Scripture. Whatever was a mystery was unknown and couldn't be known. More often than not, I'd skip over it, or at least tread lightly thinking I was not going to be enlightened to what it really meant. But, after quite a bit of study, under the guidance of the Holy Spirit, and sound teaching and reasoning from Scripture, I came to understand how the original Greek word translated as "mystery" applied to the profound thought Paul was communicating. The hidden treasures of full assurance of the knowledge of God was being revealed, and I was missing it. Unlike the genre of movies where certain knowledge is forbidden and remains shrouded, like a passing shadow, its usage here in Scripture describes something previously hidden but now fully revealed. This is special information that God has been saving up. Now He "desires all people to be saved and to come to the [full, accurate] knowledge of the truth" (1 Tim 2:4). This mystery is unprecedented unity with God the Father and Christ, His Son, and through all of us sharing the same Holy Spirit. That is why I say I am married to Christ, whose work, not my effort, made this all possible according to the will of the Father. Am I happily married? You bet!